Sue and Ian Stock only knew one of their grandparents, grandma Bea, short for Beatrice, Stock, née Burrell. The other three all died before Ian and Sue were born, just as three of Alex’s grandparents died before he was born, and two of Charlie’s before he was born. (Grandma was still alive when Charlie was born, but did not stay for long). 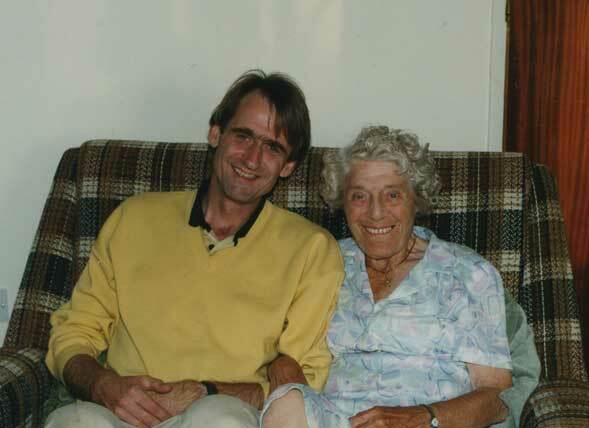 On the left is Ian’s Grandma’s last surviving sibling, Aunty Nellie. When this photo was taken back in 1996, she still enjoyed a good old-fashioned knees-up, and danced every week!! You can see the spirit in her eyes. Nellie had eleven brothers and sisters, all raised by a foreman printer who made it his business to give every one of his children one hundred pounds sterling on his or her wedding day. It doesn’t sound like a lot in modern currency, but it was almost a heroic achievement. Nellie lost her husband Len in the early ’90s, but still has her children and a whole lot of nephews and nieces, many of whom still keep in touch with her, the last survivor of her generation in her family. 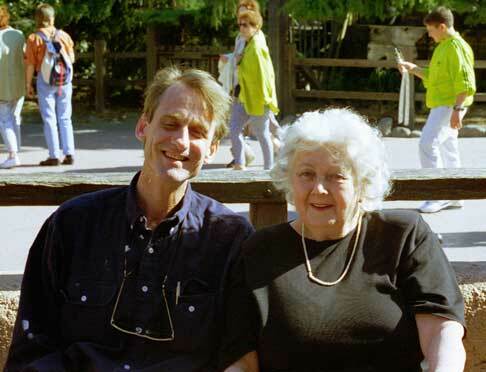 On the right is another photo taken at her home in late 1996. 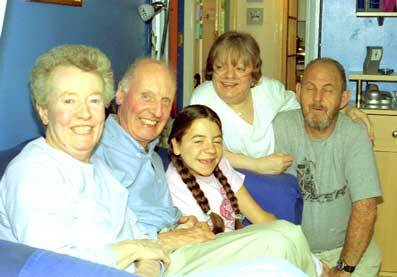 Margaret, her daughter and her son-in-law David are with Aunty Nellie, Papa and Charlie. Nellie also has her son Bob and daughter-in-law Vicki, several grandchildren and not a bad life. Ian feels like a bit of a twit because Nellie’s children and nephews and nieces invited Marie-Hélène, Ian, Charles and Alexander for a bash during the summer of 2001, and he then lost the roll of film that he took of them all! 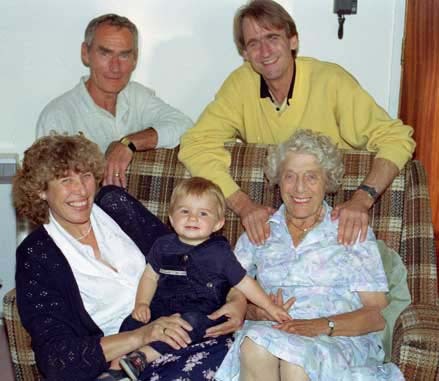 Here are two other Burrells, Tony and Audrey, with their daughter Jacqui, son-in-law Keith and granddaughter Nathalie during a visit that Ian made to their home in St. Alban‘s in 2004. The Burrells all have this incredible spirit. Yet there is something surprisingly opaque about a family, and something almost impenetrable about trying to go back in a family’s past. You can know much more about the history of the 20th century on the grand scale than about one family’s history of that century. The remaining photos on this page look at a few anecdotes from our family history, and we first move on to Ian’s mother’s side of the family. Here are some of the Warringtons. first from right in the photo on the right. She is Grandma’s sole surviving sibling, having lost her older sister Margaret in early 2007 and her kid sister Grandma and brother Cyril both in 1996. Ron is her younger son, and Louise (on the left) is his wife. Also in the picture is one of their two sons, Alec, Vi’s grandson, with his wife Sarah. 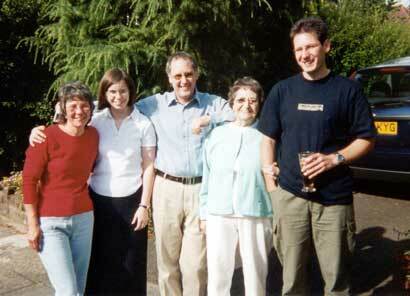 This was taken in Ronnie and Louise’s driveway in Solihull during our visit in 2001. Aunty Vi lived a five-minute drive from Ronnie and Louise. The picture below left embodies one of our family anecdotes. Ron’s father Alec was always a bit of a mystery, a mystery that Ron set himself the task of resolving. Going back into a family’s past is extremely difficult, especially if the people who lived it did not want anyone to know what you are looking for. Although it took Ron years, he did finish by clarifying what were for him the most important things. But loose ends remained and continue to tantalize. At one point, one of the people whom Ron found was mistily aware of some new details. He said, for example, that he thought that Alec had a sister. No-one else confirmed the possibility: others denied it outright. 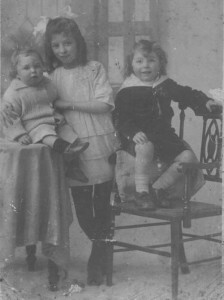 Moving on, or should we say back, on the right are Aunty Vi, Aunty Margaret and Uncle Cyril, before Grandma was born, probably around 1925. Aren’t they cute? Even a working class family like this one in Birmingham could afford the occasional family portrait. We are very grateful that they did. On the left below, the same three siblings with Grandma, their kid sister, about 50 years later at the Stock home in Marlow. They were so happy to be together, as they only were occasionally in their later years. 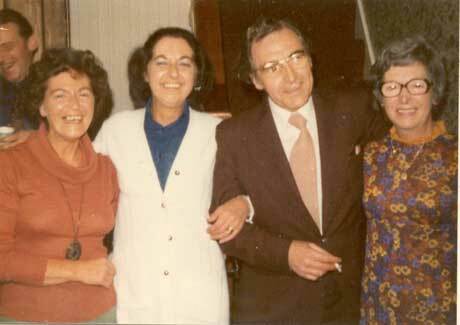 From the left, Vi, Cath (known as Grandma in this website), Cyril and Margaret, with Jim Stock laughing in the background. What does not show in either picture are the early deaths of both of their parents (Grandma was an orphan at 17), and the rich but often sad lives that these sisters and brother of Irish descent lived. How do you capture those lives? You don’t. You give the facts, and an anecdote or two. Vi still lives close to Birmingham: Margaret and Cyril still lived in the area until they passed away. Only Grandma had moved away, initially in 1944 when she joined the ATS, the women’s army, after her dad died. The families of each sister were formed by the Second World War. Margaret’s husband Ron went to war across North Africa and Europe with Montgomery and came home six years later, his older son Peter already six years old. Alec came back from the War in France, and met and wooed Vi. Vi was looking after Grandma Bea Burrell when his son met her sister. That’s how Granddad Stock met Grandma Stock! Cyril would not marry because he did not want to inflict his progressive blindness on anyone. He won a patent for an invention he made in his employer’s machine shop, and the same employer laid him off for good years later when his sight no longer permitted him to work. He never complained. Back to Ian’s father’s family. photo on the right. They are relatively distant cousins. 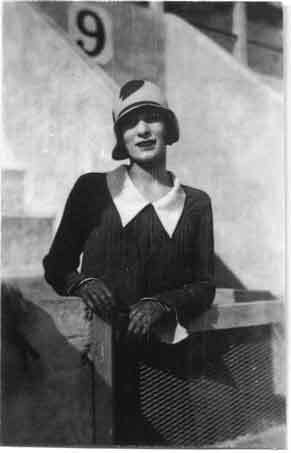 Veronica’s paternal grandfather was the brother of Ian’s paternal great-grandfather. Or something like that. I never get it entirely straight. Interesting and gregarious, these Stevens were kind enough to visit us at Le Tahu in 1995, coming all the way from their home in Aberdeen in Northeast Scotland. 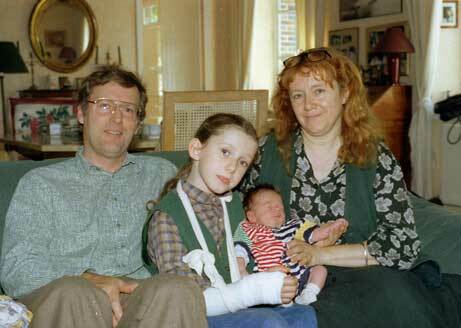 Angus, the pony-tailed boy holding Charlie in the picture, promptly broke his arm in our home emulating our children in jumping from the bunk bed across to the wooden beam. He lost his grip and landed awkwardly, and and we all spent a hairy night at the local hospital. They were all very nice about it, didn’t hold it against us at all, but we felt awful. In 2007, Angus Stevens is living not too far from his mother in Sydney, Australia. The photo on the left was taken at Disneyland in Paris in May 1997. Papa was showing his fatigue after an eventful spring. Veronica Stevens’ mother, Angela Hodges, née Stock, was grief stricken. She had just lost her husband. She and the Stevens family had tried to come to our wedding but could not make it because of car trouble. So we met them the next week at Disneyland. We keep in touch with Veronica and Angela with Christmas cards and the occasional email. Unbeknownst to Veronica, Bruce and family, Nick and Tom spent most of the summer of 2001 with their mother in Quiberon in Brittany. The Stevens family passed through the Quiberon area on their summer holiday at the same time, and sent us in California a postcard from there. Unfortunately, life for the Stevens family deteriorated after Veronica was diagnosed with cancer. To his shame, Bruce left her and soon set up house with another. Veronica soldiers on, spending much of her time in Australia for its therapeutic climate. We saw Angela again during the summer of 2007. How I met your (step)mother!